My book research has taken me to some really interesting places in B.C. While the research phase is mostly complete, in some ways I really hope it never ends. I will probably just begin to concoct reasons to go on more research trips. Writing for a blog no longer counts since it never really returns anything to make paying for all of that the research worth it. Unfortunately, podcasting doesn’t do it either but I’m still working on that one. This past summer, I was privileged to be able to meet with winery owners, wine makers, and archivists while visiting Vancouver Island and Salt Spring Island. The last time I visited was in 2012, I was sick, and couldn’t smell or taste a thing. I relied on my wife to be the designated taster and bought only a few bottles on the whole, rainy trip. It peaked my interest though because the last few times that I’d tried wine from Vancouver Island, I was not really that impressed. Vancouver Island to me was grey skies, rain, logging trucks, tiny highways with lots of stop lights, and views that were off-limits unless you were on a ferry or had waterfront property. Victoria, like all capital cities in North America from Albany to Washington, DC, are always touristy, transient, and freakishly sanitised so that everything appears lovely at all times, just so that visiting diplomats get only the best impressions of the province, state, or country. Get outside of the city however and things start to get interesting. What I learned on my previous trip that was confirmed and raised on this recent one is that Vancouver Island is an amazingly interesting place to make wine. Forgot the wineries that bring in grapes from the Okanagan, make wine from it, and then try to hide it or downplay it somehow (you know who you are), there are some spectacular wines out there. Wineries are doing great things with Pinot Noir, Marichel Foch (I know – it’s one of those big, scary hybrids that we’ve all be told are from the bad old days of B.C. wine’s past…), Sauvignon Blanc, Pinot Gris, Ortega, and others. They don’t taste anything like Okanagan wines AND THAT’S AWESOME! They are finally starting to taste like the place that they come from. Here is my take of wines from Vancouver Island: They are our version on Italy. Let me explain. What I mean is that in general (very generally), the wines here exhibit a bright, fruity quality that I’ve always equated with traditional Italian wines (before they got all “Parkered” when everyone started oaking the crap out their Chiantis). They are not overtly tannic or grippy in any way. They are briskly acidic, fresh, and elegant in a way that hotter places cannot get away with. The alcohol levels are way more in check than some Okanagan wines, and with a much lower risk for frost, the growing season is longer. The result, if done right, is amazingly complex wines that are just begging to help make your meals that much more awesome. Try using a Wine Islands wine in place of an Italian wine next time you have lasagna, spaghetti, or any other Italian-style dish. That style of wine is particular trendy right now (Dolcetto anyone?) and if the Wine Islands can play their marketing cards right, they could come out of this trend with a stable, well-respected industry that consumers will know to reach for at the wine stores. That is the key of course to any wine region but particularly to the Wine Islands. The turnover rate of this region is far higher than the Okanagan. Wineries are easy come, easy go here. The lucky ones like Blue Grouse, Cherry Point, and Beaufort have been able to attract new owners. Others (Godrey-Brownell, Echo Valley, and Marley Farm) have not. It is frontier wine production in a lot of ways. The Wine Islands is a region that is worth supporting and I hope that you do. When you head to a quality wine store in the future, ask for an adventure. Ask them if they have any wines from Vancouver Island or any of the Gulf Islands. It’s a great way to experience the taste of the coast and is always going to be cheaper than the ferry. There have been a few new additions to the winery scene in the south Okanagan and Similkameen valleys recently. As I have been deep into research for my book and WSET diploma, the “blogger” part of my brain that usually jumps out in front whenever I see a new winery sign on the road has been preoccupied for the better part of a year. Rest assured, I am getting back into the swing of it although not with the same pace that I used to. I’m sure this will pick up again as soon the book reaches production. So here are a few of the wineries that I’ve been able to visit over the past couple of weeks. Two of them are in Osoyoos and one in the south Similkameen Valley. Osoyoos has generally been slow to develop wineries. Just ten years ago there was only one – Nk’Mip Cellars – before Young & Wyse, La Stella, and Adega on 45th opened their doors. 2016 may be the first year ever when vacationers staying in Osoyoos don’t have to venture very far from their hotel to spend a day or two tasting the local wines. Blue Sky Estate Winery is the newest winery in Osoyoos and, for visitors to the area, this might be off the beaten path just slightly. Locals know it because it is just down the road from the BC Tree Fruits packing house (where we locals often buy our apples, peaches, and nectarines) and motorcyclists know it because it’s an awesome, winding road to get into town without a lot of cars. It is absolutely worth the drive and is quiet and out of the way. They have a beautiful patio to stop and enjoy the view so there really is no rush when visiting. It’s a beautiful location and they have a welcoming and spacious tasting room with a large tasting bar. The labels stand out brilliantly without being gaudy. The wine portfolio is concise and strong across the board. It is based on the grapes that are most suitable for the Osoyoos area – Viognier, Cabernet Sauvignon, Syrah, and Cabernet Franc – so there may not be everything for everybody. The Rosé is wonderful and has been a big seller since they opened in July but the whole collection is quite strong. Overall, it was a fun and welcoming experience that is well worth seeking out. This winery joins The Vine Glass and Forbidden Fruit on Sumac Road south of Cawston, which makes it one of the three southern-most wineries in the Similkameen Valley. The addition of Liber to that stretch of road now means that there is a stunningly beautiful, serene destination for a quick afternoon of wine touring that is only 15 minutes away from Osoyoos. The wineries at either end (Liber and Forbidden Fruit) both have beautiful picnic areas for a little extra lounge time. New to the BC wine industry, Mike and Nicole took over a recently developed winery that had not yet opened. They hired Pascal Madevon as their winemaking consultant who will be guiding them through their first vintage this fall. The current lineup of wines – a red blend, a Cabernet Franc, and a Chardonnay – is short but worth it. The Chardonnay stands out at this point in time but the reds might still need a little more time. All come from the excellent 2015 vintage. Two of the wines were given scripted names that show that they clearly aren’t taking themselves too seriously, which is refreshing these days. The “Let’s Be Franc” Cabernet Franc is bold and assertively fruity while the “Everyday Chardonnay” is a great example of a big and rich wine that is not bombastically oaked – no vanilla or creme brulée here in this wine – but it has a beautifully full texture and fruit flavours. Perhaps the name belittles the wine’s image somewhat because I believe it is clearly more than just a run-of-the-mill version of this grape variety. If there was anyone in the industry who have lucked out with the old business adage “Location, location, location…”, it is Bordertown. They are right on Highway 97 leading north out of Osoyoos and are super easy to access. In fact, it would be almost impossible to miss this place. And really, you shouldn’t miss it. Stopping in is a rewarding wine tasting experience. There is the past, present, and future of the BC wine industry embodied in their sizeable portfolio of wines, especially in the whites which make up the majority of their wines. It’s odd that a winery in Osoyoos would be stacked so heavily on the side of the whites and not reds but the reality is that in the hot summer, a cool bottle of tangy Pinot Blanc or Gruner-Veltliner is just what the doctor ordered. There is a lot of choice when it comes to whites, which makes for a very enjoyable tasting. There is a Muscat, Riesling, two Chardonnays, Pinot Gris, and Gewurztraminer in addition to the aforementioned Pinot Blanc and Gruner. For reds, being Osoyoos, they are based on the biggies – Cabernet Franc and Syrah are the two single varieties and The Living Desert Red takes on a Cheval-Blanc-like blend of Cab Franc and Merlot. Before you write off the blends as the simple, base-line wines, be aware that The Living Desert Red is one of the few wines that have won a Lieutenant-Governor’s Award for Excellence in BC Wine as is the deepest and most complex red wine that I tasted in their portfolio. So, please check out these new wineries during stops between your favourites on your next visit to BC’s wine country. It’s always an adventure to taste a new winery’s wines and often, you will be rewarded with the experience. Regional associations of wineries (sometimes blandly referred to as “generic marketing bodies” in the wine industry) are not a new phenomena in B.C. They lurk in the background of tastings and marketing campaigns in the Okanagan, Vancouver, and other key markets. I’m not even sure that many consumers are all that familiar with them specifically and perhaps that’s not a bad thing. They are kind of under-the-radar organizations that represent many (and sometimes, but rarely, all) of the wineries within a given geographical region. They publish maps and buy advertising space on behalf of their wineries. When asked to name one of these organizations, I suspect that most wine tourists wouldn’t be able to name more than one or two if any at all. When I produced the “BC Wine 101” series of podcasts and posts about each region in advance of the 2013 Wine Bloggers’ Conference in Penticton, it was the representatives from each of these organizations that I consulted and interviewed for the podcasts. They are great for learning about each region but their real value is promoting all of the member wineries. They are worth getting to know because many host amazing events (Similkameen BBQ King, Naramata Tailgate Party, etc) and some of their websites have lots of great information for planning your next wine tour. So, have you been to all of these? Naramata was the first unofficial subregion to begin promoting itself as a destination through the Naramata Bench Wineries Association. As a result, wine tourists who come to the Okanagan are more familiar with or have heard more about Naramata wineries than any other region. It is ironic today that a region is that essentially on a road to nowhere is the first place that people want to go. That’s a testament to the success of the continued marketing behind the Naramata wine brand. It wasn’t an overnight success but has surely paid off well to the member wineries and non-member wineries alike. The Naramata Tailgate Party in September is always a hit and spring tasting events held in key markets ensures that there is never a dull moment for lovers of Naramata wine. It’s a strategy that has worked with the results clearly on display at any Naramata winery on any day of the week during the summer. As a touring region, Naramata probably draws the most people daily because the wineries are conveniently close together and most are within a very short drive from Penticton. Across the lake the wineries in Summerland’s Bottleneck Drive have organized themselves with some fantastic events to promote their region. The pre-Christmas Light Up the Vines events are a pre-Christmas wonderland of activity that is a rare off-season event in the Okanagan. Wine tasting on a cold winter evening is quite a different experience and Summerland is a spectacular place to do it, showcasing each winery’s unique landscape and Christmas light display. As a touring region, Summerland is a fascinating diversity of landscapes which makes it completely different from Naramata’s views (Oh look – a vineyard. Oh look – the lake). Giants Head mountain is the may poll around which the wine tourists spin, stopping at wineries that could overlook a deep canyon, a bucolic farming valley, or even (yes) a lake. The Oliver Osoyoos Winery Association represents the largest geographical region in the Okanagan Valley compared to the others and also currently has the largest number of member wineries (36). Hosting events like the Pig Out, the wildly popular Half-Corked Marathon, and Cactus Jalopies, OOWA’s events take place mostly in the early part of the summer from May through to July. The exception is the Winter in Wine Country which is held in late November. As a wine touring region, the Oliver Osoyoos region is big. You can’t see it in a day so don’t try. You will miss wineries so just note which ones they are and try again next time. This is the best place to spend an entire week because you can tour every day and not hit the same winery again, unless you want to. The vineyards are more impressive here because they are bigger and so are many of the wineries. Like the Westside there are boutiques and commercial productions here but many of the wineries are solidly medium size productions. This is the best region to tour at any time of the year since many wineries remain open all year. Vineyards in the winter are every bit as beautiful as they are in the summer. The Okanagan Falls Wineries Association represents the wineries in the region around the town of Okanagan Falls. It’s a town that many wine tourists (myself included at one point) drive through without stopping while on the way to somewhere else. The valley narrows here and wineries are far less visible than in any other region in B.C. Most tourist brochures feature a stunning view of MacIntyre Bluff with Blue Mountain Vineyards in the foreground which is just south of Okanagan Falls so it’s a shame that some wine tourists just won’t get off the highway. The big event is their Party in the Park held in July and is always a great summer BBQ beach party. As a touring region, Okanagan Falls offers diversity. Looking for rich reds, aromatic whites, top notch bistros, or stunning views? It’s all there nestled among the most narrow and geographically bizarre area of the Okanagan. The Similkameen Wineries Association brings the thunder at the historic Grist Mill every July with the Similkameen Barbeque King competition. Representing the majority of wineries in this unique valley just west of Oliver and Osoyoos, the Similkameen wineries often get passed by too quickly by drivers on Route 3 who are eager to get to their Osoyoos or Kootenay vacation destinations. As a touring region the Similkameen suffers from being farther away from the Okanagan (where there are more accommodations) and being on the road to the Okanagan. The more adventurous wine tourist are richly rewarded for venturing here however because the valley is filled with small, family run, boutique-style wineries that are making wines on a whole new level. The Wine Islands Vintners Association represents wineries on Vancouver Island and the Gulf Islands making it the only association that spans two VQA Designated Viticultural Areas. There’s lots to do here and in my opinion, if the Okanagan is our Napa, the Islands are our Sonoma. Ok, the size ratio is way off but the agricultural focus is not. The Islands are not only focused on wine. There is a lot of food-related agri-tourism integrated seamlessly with wine along with ciders, mead, and other fine beverages. In an area that seems completely odd (aka not dry) for grape growing, creative wines are made here that are finally starting to develop a wider following. As a touring region, there is no way to get through this place in a day or even a week. There are too many nooks, crannies, and ferry schedules to contend with. It’s a great place to explore by following your nose, letting one thing lead to another. In the far north of the Okanagan (where it is technically not even the Okanagan anymore) is the Shushwap Wineries, which have developed a website promoting wine tourism in their region. It’s not really a new wine region (Larch Hills has been around for years) nor are grapes completely new to the area (first vineyard was in 1907, before Oliver even existed). The northern latitude means that they must use different grapes than in the Okanagan but to me, this is what makes it interesting. As a wine touring region, the Shushwap is convenient for travellers on the Trans-Canada highway but like the Similkameen, has to work a little harder to get people off the road long enough to try their wines. It’s a different style of wine making and it’s a style that I think is unique to B.C. and worth checking out. 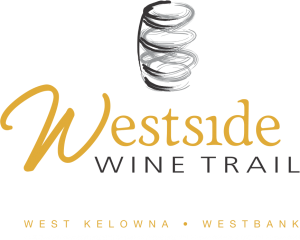 Although the first winery in the Okanagan was in Kelowna, it has unfortunately remained the latecomer to the regional marketing game. Confusingly, it is also the most disparate with at four smaller regions represented by associations. (Maybe they need an association of associations?) Thankfully recent years have seen a concerted effort on the part of wineries here to organize themselves into associations to attract wine tourists as that sector grows more competitive. Starting in Kelowna, the organizations loosely follow the compass. The largest region near Kelowna actually across the lake in West Kelowna. The Westside Wine Trail represents the biggest diversity of wineries (in terms of production size) within the smallest geographical area. There are all sizes of wines from garages and quonsets to large commercial production facilities, organic producers to, well, not organic producers. Mission Hill tends to top the pyramid here as an attraction and literally sits atop of Mount Boucherie. Other wineries are tucked neatly into their vineyards on the slopes looking east. It’s difficult to imagine an organization that can represent the myriad interests of such a diverse group but the Westside Wine Trail does it and apparently quite successfully. As a touring region, everything is relatively close together just like in Naramata which makes it easy to spend the whole day there. Many wineries are also open year round. Kelowna’s Fab 5 Wineries represents the wineries on the benchland east of Kelowna, historically known as the K.L.O. Benches (named after the Kelowna Land and Orchard Company that subdivided the land in the late 19th century). As the name suggests, there are 5 wineries in this group which is a perfect leisurely wine touring day trip. The wineries are all small, boutique productions and many are quite fun and creative with their marketing image. As a wine touring region, it seems like a completely different world even though Kelowna is so close. The views of the valley and lake are unique and far more expansive than in any other wine region. There is a lot of history here as well since First Nations, fur trappers, pioneers, ranchers, and orchardists all recognized the beauty of this part of the Okanagan. The Lakeshore Wine Route encompasses four wineries on the south side of Kelowna. The wineries operate some of the oldest continually producing vineyards in BC. CedarCreek has been operating as a winery the longest while Tantalus’s vineyards are older but has been a winery for less time. The established winery names draw visitors here because, just like Naramata, this is a road to nowhere. People have to want to come here rather than just stop off on their way to somewhere else. They have been flocking there for years which is a testament to the quality of the wines produced there. As a wine touring region, the Lakeshore wine route is geographically small and makes an excellent afternoon tour destination. Eager tourists who head there in the crisp morning will find it even better with less crowds and beautiful views of the lake in the morning. Last on the scene is the Scenic Sip, an exciting new association that includes wineries north of Kelowna in the area known as Lake Country. Like Summerland, there is a wide diversity of landscapes to see at each stop, making this an aptly named wine trail. There’s a lot of energy here from the younger wineries which pairs well with the long-established wineries like Gray Monk, who have been successfully attracting people to drive up Camp Creek Road for almost 35 years. As a wine touring region, this is the first place that people can see flying into Kelowna. You are literally mere minutes away from your first winery wine tasting coming out of the airport. The higher elevation of wineries like Gray Monk and 50th Parallel mean that there is a much grander view of Okanagan Lake than anywhere else in the valley. The lake itself is more narrow here, more steeply walled, and far more green compared to Osoyoos’s brown. Worth a day trip but it may take you a little longer to get to all of the wineries here in the summer so plan extra time. Newest on the scene is the Kamloops Wine Trail. It’s so new that I haven’t actually visited this region yet. It’s absolutely on my list and I look forward to heading there. With hot summer temperatures, the Kamloops area has a lot of potential for growing grapes. It’s the winters that will make or break this region, not only in terms of viticulture but also for visitors. There has been some great social media promotion and interaction from this region. It’s also exciting to be able to see the early days of a future wine region which makes now the time to see Kamloops. The wineries in the Kootenays are not yet organized into an association and perhaps it is still too soon in their development. The Fraser Valley used to have a winery association but that quietly disappeared, at least online. Perhaps a new group of winery owners will feel the need to come together and promote their region. So have fun touring one (or many) of B.C’s wine regions. Let me know about your experiences. Please post a comment if you have any questions. Happy wine trails and cheers from wine country! Located just east (uphill) off Naramata Road, Mocojo is easy to find. Just look up the hill after entering the Naramata boundary and follow the signs. The actual address for you GPS people is 1202 Gawne Road but I think it’s much safer to keep your eyes on the only road to Naramata so you shouldn’t have any trouble finding it. The view is stunning. There are lots of views in Naramata for sure, but not always with so few obstructions. Owners Dianne and Kon are welcoming and absolutely wonderful to chat with. They are true garagiste wine makers, meaning that their winery is located in an actual garage. When so many wineries go out of their way to build a fancy tasting bar with lots of cute gifts to buy in it, Mocojo is refreshingly down-to-earth and authentic. They sell wine and t-shirts. Kon grew grapes before making his own wine so it’s no surprise that the wines he makes reflect that attention to detail in the vineyard more than any splashy wine making techniques. Expect to be welcomed like you were a long-lost family member, except that not everyone has family that can make wine like this. The wine shop is sparse but comfortably shaded so even when it is hot, it is still comfortable. All of the wines that they have available for sale are also available for tasting although one of them had sold out after only my first visit there. A word of warning though: Staring at the view for too long has caused more than one person to seriously consider a career change just so that they could move to the Okanagan to have a view like this. It is that good. The view is distracting but the wines will hold your attention for sure. Aromatic whites and sleek, powerful reds are the focus here. I have not yet been able to taste the whites but the reds are absolutely solid. The Malbec (sold out at the winery but available in a few private stores – I know one in particular near me and I’ll tell you where it is but only for multiple non-sequential, unmarked bills) is truly beautiful – dark, smooth, and deeply flavored as all good malbecs should be. The Foch is also dark and distinctly fruity as only Foch can be with a complex nose and a uniquely dark tangy quality. Foch is an acquired taste that some people never acquire, which is fine. To each their own. But don’t pass up the chance to try it in the tasting room. Make this a definite stop on your next trip down Naramata Road. Cheers from wine country! Located on McLean Creek Road just east of Okanagan Falls, Synchromesh is on a flat area just behind Peach Cliff (that big rock that you see can towering over the town of Okanagan Falls. It’s about a kilometer out of town and it’s on the left just past Meyer Family Vineyards. If you’re going to visit them, you’d better do it quick. On my recent visit, 3 of the Rieslings were sold out and only one red was left. They are not expecting to make it through the summer with any inventory intact so the sooner you get there, the better. Sometimes it’s a race to get to these small producers when they have their best wines available and that’s what boutique wine touring is all about. And the prices are surprisingly reasonable. Allan Dickinson doesn’t wear shoes while he’s on the job, or at least he wasn’t wearing them when I first met him earlier this spring. Perhaps it keeps him rooted (metaphorically) to the earth that grows his grapes. Perhaps it was just one of those shoe-less days. Either way, he is firmly attached to terra firma and he walks the walk when he talks the talk in the wine shop. You will get an elucidating, convivial tasting experience that borders on a religious experience and is devoid of any of that bland “you will get hints of apples and rosemary…” banter. Alan is down to earth, the real deal, and he talks about his wines that way. He comes by it naturally so if it happens to be Alan’s dad, John, in the wine shop, your experience will be very similar. Riesling is the big one here and even though they have won a Lieutenant Governor’s Award for one, they certainly aren’t one trick ponies. The reds that I’ve tasted are at the same high level as well. These are seriously amazing, grand cru-level wines (although as per my criteria stated previously, I can’t call them an official grand cru yet…) I have personally witnessed experienced tasters and neophytes all recognize this so I know it’s not just me. Their emphasis is on single-vineyard wines which, confusing as they can sometimes be brand-wise, are a perfect platform to demonstrate Riesling’s (and Cab Franc’s) uniqueness and potential. Want to really understand what the word “terroir” means? Taste all five Rieslings in one sitting and you will never forget it. 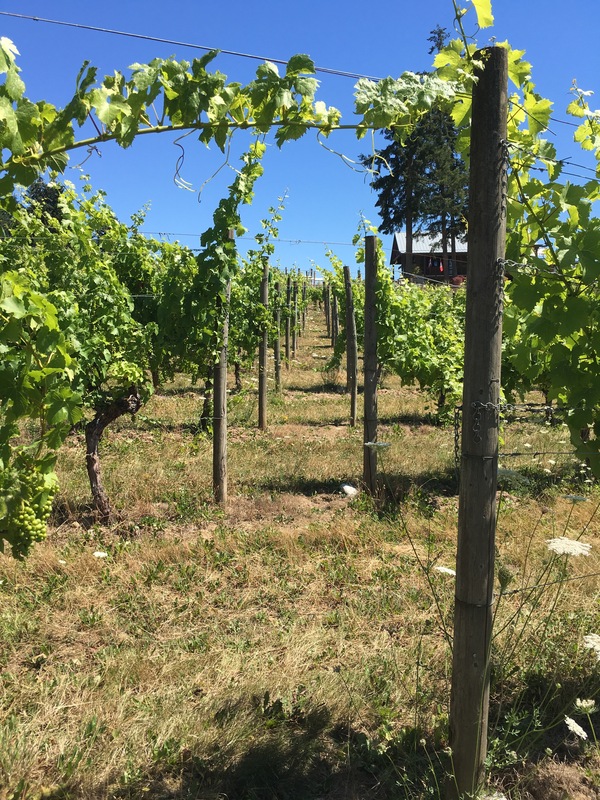 The growing number of wineries and wine lovers that are turning their attention towards high-quality Riesling shows that this variety has a promising future in BC. Alan and Synchromesh have almost guaranteed that. Located on the newly developed Scenic Sip wine route around Lake Country, 50th Parallel is a little far off the main route on Carrs Landing Road. Various routes will get you off Highway 97 to the shores of Okanagan Lake near Okanagan Centre. Follow the road north until you reach 50th Parallel. Because it’s amazing. Stunning. Awe-inspiring. But perhaps I’m being too subtle and understated. I’ve seen a lot of wineries and I’ve seen a lot of new wineries just starting out. This place is unbelievable in the sheer amount of details involved. Nothing has apparently been overlooked. The name 50th Parallel invokes their own latitudinal position and owners Curtis Krouzel and Sheri-Lee Tuner-Krouzel have creatively riffed on that for everything from marketing to design and architectural elements of all kinds. The results are clearly visible in the new building’s architecture (parallel lines are everywhere, vertical windows) and branding but are subtle rather than in your face or over the top. It is also a vineyard with a past. For BC wine history buffs like me, this was a vineyard planted with hybrid grapes that used to supply wines to commercial wineries until the pull-out program in the late 1980’s. It was never replanted and remained essentially abandoned as a vineyard until purchased by Curtis and Sheri-Lee in 2008. Expect to be wowed. The tasting room is currently at one end of the winery where all of the tanks and sometimes barrels are located. Sometimes winemaker Grant Stanley might be working on barrels or racking or filtering and you’ll be able to watch the action. At the very least, it smells like a winery should – clean but with a cool, damp, refreshing feel that wine loves as it matures. The tasting bar is made from rafters from their old Quonset hut that used to be the winery for their initial vintages so it has a beautiful curve to it. There are guided tours of the vineyard that are available for a price and must be booked in advance. It’s well worth it if you like seeing where the wines come from along with stunning views of Okanagan Lake like you’ve never seen before. Pinot Noir is their focus here along with a collection of aromatic whites. All the wines are solid performers. They’ve been racking up awards with all of them so nothing is “filler material” at all. The Gewurztraminer is a much drier style than most BC wines which brings out a unique aromatic profile. The Chardonnay is what I call a “classy” style – meaning, it has some oak flavors on it but it’s just a part of the complexity rather than a dominant flavor. It is a style that I think does well in BC And if you still write home at all, it’s the Pinot Noir that you will want to mention. Just smelling it in the glass, it made my eyes bug out of my head and I heard that old-style car horn sound (a-ROO-ga) that always sounds funny no matter how old you are. Needless to say, I took that wine home with me that day along with a bottle of the Chardonnay. I first visited 50th Parallel in the early spring and was blown away by the thought that went into everything that they did here and the ultimate end result is absolutely evident in the wine. Complex aromas and flavors, balanced acidity, and just a general sense of thoughtful artistry is clearly in every sip. I’ve found that sometimes new wineries take a few vintages to really get their style established, especially across the portfolio but I believe that 50th Parallel has really reached that phase early on. When it does happen this quickly, it’s usually by happenstance, coincidence, or just blind luck. But in this case, with the amount of detail that went into the planning of this winery, I have come to the conclusion that this consistency is entirely by design. I’ll meet you anytime at the 50th. Cheers from wine country! Corcelette’s new winery and wine shop have a prominent physical position overlooking the Similkameen Valley (Another Similkameen winery?? Noticing a trend yet?) from the northern slope which you can see from all over the Keremeos and parts of the Cawston area. It is close to the town of Keremeos at the junction of Route 3 and 3A and is located on Upper Bench Road. Follow the signs for the Grist Mill and keep going just a little further and it will be on the left. Look for the huge stones near the end of the driveway. At this point, wine maker Charlie Baessler does not make very much wine and he and Jesce Walker consider themselves to be garagistes although they probably won’t be that way for long. The wines that they make now are beautifully balanced and wonderfully complex made by two of the nicest people in the industry today. It’s kind of hard to explain these things without seeming all New-Agey but the personalities of the people who produce the wines can strongly influence how much you enjoy a wine. If I’m not connecting with a producer on a personal level for some reason (weird attitudes, bizarre methods, or just a “bad vibe”), it’s highly unlikely that I will like their wines. For small producers, personality will go a long way to driving sales and establishing long-term relationships with customers. I think that’s why some people prefer small boutique producers rather than large corporate wineries because they are so far removed from any human element. That’s just a theory though. Regardless of winery size, personality comes down from the top and the gang at Corcelettes are awesome and they let that awesome filter down through everything they do. The other big reason to go, and go soon, is that they may be sold out fairly quickly and you really don’t want to miss out on the experience of this place. This is a small, boutique winery so expect a small tasting room with only one or two people staffing it. This isn’t a large volume winery with a big tasting bar so while they may not have many wines to taste, they will certainly have a lot of things to tell you about how they were made. Personalized service and lots of stories are part of the fun with visiting boutique wineries. They may also not have everything available to taste when you visit so enjoy the wines that they do have. You will want to be taking lots of photos at this winery. The view is truly inspiring. It’s perfect for group shots. Two whites, two reds, and a rosé in the middle. And, did you notice that first grape variety in the Trivium?? If not, I’ll type it again for you slowly. Yeah, that’s right. I typed it. There’s not a lot of that grape variety in BC let alone in the Similkameen. I’ll let you be the judge of how it tastes but if I have to type it again, I totally will. The style here is subtle complexity that can evolve over time or even as you drink a glass. The Gewurztraminer starts out with a beautiful set of flavors and then, when you aren’t looking, changes into something else beautiful altogether. The Trivium, unique in the Similkameen with 50% Chasseslas (there I go again…), does that to somehow. The Oracle is refreshing without being wimpy while the reds bring a solid fullness without any harsh, unripe tannins. This is what prudent, quality-conscious grape growing can do for making wines. The Baessler family has a history doing just that. If you’ve ever tried the Clos du Soleil Growers Series Pinot Blanc, that wine was grown by Urs Baessler, Charlie’s father, and is what brought them to my attention years before Corcelettes was released. Go there. Be amazed. Enjoy. Tweet it with #bcwine. Then enjoy it some more. A new series for Wine Country BC – “You’ve Gotta Visit…” where I will feature new, exciting, and interesting wineries that you absolutely should not miss on your travels through wine country. I get asked a lot where to go for unique experiences and this series will focus on some of the new ones that I notice on my own travels though the Okanagan the rest of BC’s wine country. 2015 is showing a good crop of new wineries and as you’ll see from this first featured winery, they are really upping their game when it comes to bringing out a great experience. Hopefully I will feature a new winery each week, if not more often, so that you can plan your trips and stop in. Tell them you heard about their winery from Luke at Winecountrybc.ca. Cheers! vinPerdu Cellars is located mere minutes south of Oliver right on Highway 97 and is on the left as you drive south. They have a large sign right out front and a parking lot that is easy to get into and out of without turning around. There’s no reason not to stop here and every reason to stop here. Convenient location? Check. (It’s right on the highway.) Beautiful tasting room? Check. Solidly built and unique wines? Big check. Amazing winery experience? Absolutely. Assistant wine maker Catherine Coulombe and her family have really done an amazing job of creating an idyllic space geared for a real wine experience. Even though the highway is right there, you won’t even notice it because the commanding view of the vineyards really steals the show. Thanks to some amazingly effective landscaping, you won’t even hear it either! Each part of the wine shop is beautifully designed for form and function and even includes a little play table for wee-ones. It is truly a first rate example of a wine shop design that blends customer experience, functionality, and aesthetics brilliantly. All five of your senses will get a treat in this wine shop. As if the beautiful vineyard view out of the windows wasn’t enough, the wine shop is filled with beautiful artwork by Catherine’s sister, artist Nathalie Denise Coulombe. A focused portfolio of wine is available as of spring 2015 – Pinot Gris, Chardonnay, Gamay Noir, Cabernet Franc, and Compass (a blend of Merlot and Cabernet Sauvignon). “French style, approachable wines” is how Catherine describes the wines at vinPerdu. They were tasting quite young when I tasted them on my visit but the style is precise and very enjoyable. There are no powerful, full-throttle, tannic monsters here nor are there aromatic varieties like gewurz, riesling, or sauvignon blanc. What you will find is selection of tasty wines that will get along splendidly with just about any food you can imagine. In addition to wine, the Coulombe’s have planned catered food pairings to accompany the wines on weekends and terrines available to purchase while enjoying the deck that overlooks the vineyard. The tasting bar can accommodate 8-10 people comfortably and there is also a private tasting room for small groups. There are relaxing chairs and a shaded deck overlooking the vineyard. It’s not a small room but it isn’t big either. When so many wineries out there look and feel more like bus stations, it’s great to find a place to stop in where you can feel at home. Have you been there? Let me know if you visit vinPerdu by leaving a comment below.